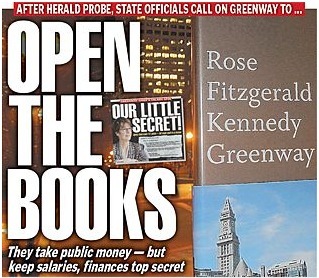 Transparency issues at the Greenway Conservancy (GC) made multiple cover stories this week at the Boston Herald. The GC is a private non-profit that leases the Rose F. Kennedy Greenway public parks and is partially funded with taxpayer dollars. There is nothing like an insulting, errant email to motivate a reporter. Even the Globe chimed in, sort of, after the State demanded disclosure of Greenway records. To NorthEndWaterfront.com readers, this week’s revelations are nothing new. We have posted about these exact issues for several years that are now starting to make it to the mainstream news media. If you search “Greenway Conservancy” on this website, you will many positive stories about the Greenway as well as a steady stream of posts questioning the Conservancy’s governance, transparency, and yes, compensation. Let’s review and see how we got here. Back at the 2009 Greenway Conservancy (GC) Annual Meeting, yours truly was chided by the GC’s Board Chair for asking a question about conflicts in the park guidelines that could hurt the public’s interest. (See Debating Development & Conflict Issues at the Greenway Conservancy Meeting and What is the Quid Pro Quo Between Developer Chiofaro & the Greenway Conservancy?). In late 2009, we started following the money trail more closely. With 31% of the total expenses going to salaries and almost nothing into horticulture, something did not smell right. (See Fun Facts From Greenway Conservancy’s Annual Report – Following the Money.) In response to questions about the money being spent on the Greenway, benchmarking became the answer and how it really isn’t that much compared to other “signature” parks in other cities. (See Greenway Leadership Council Talks 2010 Budget, Plans & Programming.) After that round of questions, the Conservancy learned how to categorize expenses into line items that appeared more operational than administrative. This has made the money trail more difficult to follow. Still, the cost per acre is clearly well above anything ever seen before in Boston, even at treasures like the Public Garden or Esplanade. In 2010, there was a series of apologetic Globe articles planted with pleas of poverty by the Conservancy that sounded awfully familiar to the hearty few of us that regularly attended the meetings. Ironically, I have to thank Dante Ramos at the Boston Globe for some advice. When I penned a letter to the editor, he called me and I happened to mention Nancy Brennan’s salary and bonuses totaled over $220,000 that year. He immediately advised me to change my lead focusing on that one point to bring awareness to everything else. Then came a game changer in July 2010 from State officials who seemed to be increasingly unamused by the Conservancy’s antics. The GC’s regulator and funding source distributed a harsh analysis and strong public chiding of the Conservancy budget and transparency issues. (See State Demands Greater Accountability From Greenway Conservancy.) Surely, we thought, now things will change. But, nothing happened. NorthEndWaterfront.com, among others, became unofficially blacklisted by Conservancy personnel who repeatedly dropped us from their distribution lists. At the same time, the Conservancy’s power appeared to grow because of the money they wielded and the political support behind them. One person who did respond was the North End’s State Rep. Aaron Michlewitz. He listened to constituents and concerns raised by the Greenway Leadership Council, the citizens oversight group that ended up powerless under provisions in the original 2008 legislation. In the Spring of 2011, Michlewitz filed new legislation to increase oversight and transparency at the Greenway Conservancy. (See Greenway Reform and Transparency Legislation Filed by State Representative Aaron Michlewitz). He helped write the original legislation creating the Conservancy and seemed to understand not everything was working in the public’s interest. I give Michlewitz credit for drafting the pending legislation. If passed, it will cap the State’s funding obligation to $4 million, down from $5.5 and give the GLC veto power over the Conservancy’s budget. Even though the proposed changes are mild and in the public’s interest, Michlewitz took a lot of flak from the Conservancy and other public officials who claim the legislation has no chance. $4.7 million is the Conservancy’s annual budget, about half of which comes from taxpayers. 5 of the 28 full-time employees make six-figure salaries. Executive Director Nancy Brennan just received a $20,000 raise, increasing her base to $185,000 (with bonuses as in past years, the total compensation would go over $220,000). So complain all you like. Nothing is going to change unless the Greenway is made into a public park, or completely privatized and has to raise all its own funds—a condition which tends to encourage thrift. Complain we will. I want to thank the diligent group of meeting-goers and concerned community citizens that pushed me to keep going with these reports. You know who you are. Thank you for your article. You have been diligently speaking out for the best interest of Boston’s citizens, and have often been treated rudely by The Conservancy Board and Executives. You have suffered insults and been dismissed by the Greenway Leadership Council. May our fellow citizens realize The Conservancy is an unnecessary, bureaucratic, bloated agency, concerned with their ill-guided plans, at the expense of their simple mission of enhancing Boston’s newest greenspace. Many of us who have tried to look behind The Conservancy’s closed doors, and asked for transparency have been treated poorly and portrayed as difficult and unreasonable. We have been made to feel that we are unwelcome. In 2010, I presented to The Conservancy and the GLC audience a comparison of budgets of prominent public parks. The Greenway enjoyed the richest budget per acre, at $4.8M. Bryant Park in New York City, with 8 continguous acres, compared to approximately 10 acres of greenspace on The Greenway, operated with a $2.9M budget. Bryant Park is an extremely vibrant park with excellant horticulture, various activities offered, restrooms, ample tables and chairs, with active use by workers, residents and visitors. Trash collection and upkeep alone should be more expensive at Bryant Park due to the extensive use. The Greenway Conservancy dismissed my comments. One would not complain about budgets, nor salaries, if The Greenway was what we all dreamed it would and could be: an attractive, respite of Nature, in the heart of the City. The Greenway could and should attract visitors near and far, boosting our much needed tourist dollars. The Greenway could and should be a park that we are proud to bring our family, friends, and visitors to enjoy. The current condition of The Greenway is unacceptable, especially because there is more than ample resources to make The Greenway into a world class garden attraction. The Conservancy, with its bloated budget and extensive staff plant few plants. Their cost of horticulture was a mere $37,000. They do not appreciate the value of horticulture nor aethetics in this public setting, and it shows. As Chair of The Greenway Gardens, I was supported by Joe Kunkel and over 300 volunteers to plant the gardens with thousands of plants on Parcel 19, 21 and 22. These gardens are still the most attractive areas, despite The Conservancy’s lack of active horticulture. Grasses have not been planted; winter damaged plants have not been replaced; improvements are scarce. I offered to collaborate with The Conservancy. Their Executive Director refused my offer of free, volunteer labor and product plus a nominal cost to ship thousand of first rate daffodils so Boston’s newest greenspace could announce Spring. Despite The Executive’s misguided attempts to prevent us from planting, The Greenway Gardens has 10,000 beautiful bulbs to herald Spring but the rest of the Greenway is bare, lacking much needed color.As was evidently their plan all along, The Conservancy ordered us off The Greenway, and alienated our volunteers. The time has come to take back The Greenway! Let DCR mow the grass and remove the snow. Let The Friends of The Greenway manage this important, community asset for the betterment of the City. It is time to take it away from the priveldged few, who think they know better than others, yet have the audacity to underperform, while vilifying community input. Let’s enhance our community and beautify our greenspace! Please continue your effort to bring this subject to the attention of the public. You deserve our appreciation. The greenway is not a park for the public. It is for the food stands, the new ticket booth that only represents some business. Nancy and her group all need to be removed. It’s like when they showed up at city hall meetings against the use of segways. They only pick and choose. They allow all other tours to pass along and through. When it’s convient they are public park when not they are a private property. However they take and use city resources. As always, thanks for your dogged coverage of all things Greenway. As a former Greenway Leadership Council member (and member of the Mayor’s Central Artery Completion Task Force for a decade before that), I greatly appreciated your involvement, and am unaware of ever having “dismissed” you. In fact, you reflected much of the frustrations felt by the GLC over the years. I am a strong advocate for greater transparency in governance, and especially in planning decisions for any design changes, or capital improvements on the Greenway. I would support an overhaul of the legislation, as regards the involvement of the Leadership Council, or public oversight in some other more effective form. Thanks for your comment. I always appreciated your work on the GLC. You often stood up for transparency and public interest in a sometimes hostile environment. I never felt dismissed by you. In fact, many on the GLC, including you, were very respectful and supportive which I appreciated. I was sorry to hear of your resignation. I sympathize with the volunteer GLC members that really have no power without new legislation or some type of other change. If that change comes, I hope you’ll consider being part of it. Put the Greenway under the DCR just as is the Esplanade and stop giving them state monies and let them stand on their own two feet. DCR can do the job of maintenance and for a lot less monies. We are all in debt to Matt and the others who have struggled for a long time to make the Greenway a public park, not the private fiefdom of Nancy Brennan. Thank you. Thank you for your newsletter, which I always read with interest, and for your continued coverage of the Conservancy’s public meetings. The next joint Board and Leadership Council meeting will be at 9 am at 185 Kneeland Street (rather than at 11 am as noted above.) I used to find their meetings informative. However, the last one that I attended (the annual meeting) provided very little information on their budget or plans. I had decided that it was no longer worthwhile to attend the meetings. You have spurred me to give it another try and I hope to see you there! Your questions were always thoughtful Anne, not that they were answered very well. I think a lot of folks were in your camp wondering why so little information was provided. If and when the Conservancy realizes they need to embrace respected community members like you, things will get better. You have been a thoughtful and persistent watchdog on this issue and your analysis, public comments, and reporting have been indispensable. Of course, your work is far from done. It’s just beginning, as the facts come out in the dailies and state officials talk of launching a long-overdue investigation of the Conservancy’s finances. The fact is that the Conservancy cannot be “reformed” or “improved” or made more transparent or accountable. It is a 501c3, a private corporation, as the board chair kept repeating at their Feb 7 meeting. The Conservancy was created to be exactly what it is. The flaws we see in its structure are precisely the characteristics that its creators sought: exemption from public integrity laws (open meeting, public record, conflict of interest, etc.) and absence of public accountability. Aaron Michlewitz’s bill will not get this entity to give up its legal prerogatives of secrecy. They may hold more public meetings, but the real business will still be done in private. Even if they promise to “comply” technically with the Open Meeting Law, it won’t protect us; I have a lot of experience with the Open Meeting Law, having sued the City Council for a dozen violations, and believe me, this board can circumvent it very easily. They have already said they won’t make themselves subject to the Open Meeting and Public Record Laws — so why go forward with this bill? Under the bill, the Leadership Council would review the budget, but they will have no real data on which to evaluate it and no power to amend it or to prevent a budget enactment. The make-up of the Council assures that it will not be a check-and-balance for the board; a majority vote to approve will be guaranteed. The Conservancy just confirmed that they will not disclose their financial records — even at the threat of losing all state funding. And they will not voluntarily give up state funding, no matter how much private money they take in. They are spending, and we taxpayers are paying, multiples of what is necessary for this park. Why are we putting up with this situation, when we can have the park we want, publicly funded — and publicly controlled? I ask that the few neighborhood representatives on the Leadership Council do what they need to do for us right now: demand all the financial data, at check-book-level detail. We need to know where those millions of dollars have gone — because they have clearly not gone into the park. Donna, would you take the lead in making this request to the Conservancy board as soon as possible? When all the information is out, the way forward will become clear. The report found that these arrangements resulted in misuse of taxpayer funds; excessive executive bonuses; conflicts of interest; questionable claims about effectiveness; and resistance to accountability. The report recommends, if public-private entities exist, strong accountability safeguards, including maximum transparency in decision-making and finances — in particular, adherence to state open records rules; maximum transparency concerning recipients of money from the entity and their performance; strict conflict of interest rules regarding staff members and boards of directors; strict rules barring favoritism and “pay to play” in connection with anyone doing business with the entity; appointment of a public ombudsperson to monitor entity activities and respond to outside complaints; and respect for the rights of union labor. The report also recommends that these entities be funded entirely out of public revenues with full legislative oversight, barring voluntary contributions to avoid the problems of favoritism and pay to play. A few years ago, I was auditing then-BRA Director Tom O’Brien’s city planning class at Harvard, and Ed Logue was a guest speaker. I asked Logue what he thought about Menino’s plan for getting private money to take care of City Hall Plaza. He said : “It’s not good to do public things with private money.” And he was someone who knew something about that. Good advice, and we should take it.